The Pantheon, literally means all gods, was originally dedicated to every gods in ancient Roman time. Though the idea of having one church to worship all gods seems questionable, some people suspected that the building was surrounded by many gods’ statues and thus the name. Other people suggested that the building itself, the dome looks like the path to heaven. It does not sound like a proper name of the building but there was no other records of the naming of this basilica. Anyway, the Pantheon remained pagan until Emperor Phocas gave the Pantheon to Pope Boniface Iv in 609 and the Pantheon is Christianized. 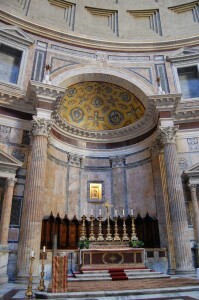 The Pantheon Basilica is dedicated to St. Mary and Martyrs since then. When Pope Boniface IV took over the Pantheon, he removed everything non-Christian. After that was done, he consecrated it to St. Mary and Martyrs and then moved the remains of the martyrs to a porphyry basin under the high altar. It is said that 28 carts of sacred bones were transported from the Catacombs to here. Since the French Revolution, the Church of St. Genevieve in Paris was deconsecrated and turned into Pantheon of Paris. In fact, it has become a mausoleum that houses the remains of distinguished French citizens. Maybe because of this, besides the martyrs that were moved here at the beginning, King Vittorio Emanuele II, Umberto I and tombs of other famous people like Raphael, Annibale Carracci (both painters) and Baldassare Peruzzi (architect) can be found in the Pantheon too. From then on, the Pantheon basilica is running as a Christian church where masses are held every week and at special events. Worth noting is the Pentecost mass and the rose petals shower afterwards. For more information about the basilica’s history, click here to find out.